1. the earliest 03/04 KRT software installs into "C:\Program Files\RACE" serial number "cdn-a469001". What is on our website is correct. Dec 2011. OK - this is the first start of the 06 zx6r tuning project that we did. We'd done quite a few 03 and 04 600's a 636's, including a magazine project bike for Ed Sorbo at Roadracing World - but this was the first Kaw we'd done in a while and the first 05 / 06 that we'd started to do. There is a black 6 terminal connector with 5 wires used - It goes into the stock wiring harness on the right side of the battery. You aren't lucky, it's not the right connector for the KRT tuning cable. You will get "can't read ECU" error. You can identify a "street" stock wire harness as its got 2 smaller black rectangular 2 wire turn signal harness connectors, and 2 larger 2 (from memory) wire connectors, 1 black and 1 grey - tucked in back towards the rear of the bike. The KRT "tuning cable" will lug right into that connector, but it won't communicate. 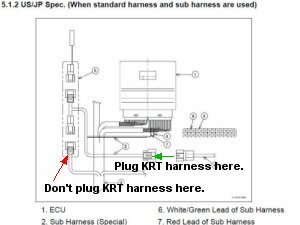 You need the KRT adapter harness as in the diagram to the left. These 2 gray text boxes only for 03-04-05-06 zx6rr 600 and zx6r 636's. 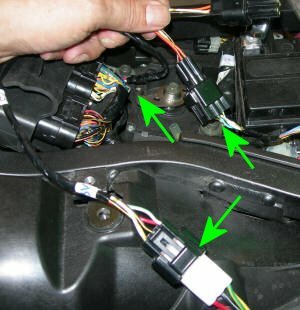 If you have a kit harness or a ZX10, skip this box - If you are using a kit ecu with a stock wire harness and the Kawasaki kit harness adapter - LOOK! This is the larger of the two stock wire harness connectors that plug into the ECU. The 2 wires on the kit wire harness adapter (the $30 part you had to buy so you could use your stock wire harness), plug into locations 20 and 22. 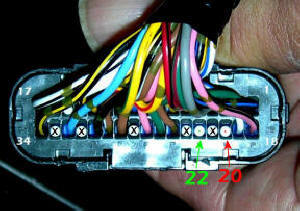 #''s 20, 21, 22 and 23 are blanked with white pins in the stock harness from the factory. The wire location numbers are small and are 1 and 17 across the top and 34 and 18 across the bottom of the flat back connector plate in this picture. Unclip the back flat connector housing, lift it up, remove #20 and #22 white plastic blanking pins. 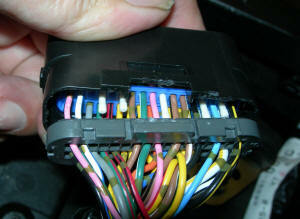 Replace the flat back and insert the 2 adapter harness wire into their proper holes. The small metal terminal must be oriented correctly, in reference to the black plastic connector housing or it will not insert properly (fully). With the connector oriented with the latch UP, the metal terminal must be oriented with the backbone of the terminal closest to the connector latch mechanism. I.E, the female pin receptacle "tube" of the terminal would be on the bottom of the terminal when oriented properly. This picture shows the black plastic connector housing with the latch mechanism oriented UP. The Kaw kit Tuning Software uses a "one time purchase" ECU to PC/Laptop Interface Cord, pn:26031-0240. It's not just a cable, it's a translator box / adapter wire harness to allow communication between your computer and the kit ecu. Install the software: I suggest using the default C:\Program Files\RACE. On the 03/04 "RACE" software - The serial number is "cdn-a469001". (It's ok for me to publish that, according to the Pope). It's on the CD sleeve that came with the KRT software, many years ago. On the 05, 06 to prob 07 ish "FITool06Mk2", the serial number is still "cdn-a469001". If you are "reloading" the software for some reason, make sure you delete the directory RACE before you try to reinstall or the program's status bar will go about 1/4 way, wait a second and then disappear - with no error message. And it will not have reinstalled the program. The KRT software is finicky about conflicting "INI" files. (Dammit Jim, I'm a tuner, not a programmer!" If you are planning on deleting the RACE directory and reloading the install - make SURE you save any lower level WORK files that you may have done and want to save before you delete RACE. You'll have to first "pick" your machine. That sets up the program with your bike's parameters and some other things. Main menu: click on Set, Machineselect. If all went well in the install, you'll see a list of bikes. The 05 zx6rr(ZX600N) is used for the 05-06 zx6rr's and the 05-06 zx6r 636. Early RACE versions of the software don't have Machine Select - just pic the "est" file and that's the 03/04 zx6r. Next, you need to "Open" a calibration file. It's a group of maps that offset the fuel, ignition, etc. values from the semi-permanently programmed internal kit ECU maps. Main menu: click on "File/Open" If all default paths were accepted during install, you be able to choose a map that is in the WORK subdirectory of the selected machine's subdirectory (machineselect). At first, you'll only get a choice of "standard_data.est" or similar. This is the beginning table. It consists of a group of "zero" maps for the semi-permanent ECU tables that Denso flashed into the ECU. You could download the "standard_data.est" into the ECU and the bike would run the same as before. Choose the "standard_data.est" file. You will now be able to choose a single table in the next box. Pick any one of them for now or hit "cancel". Once you have gotten to this box, either way, you can check the PC to ECU communication. Main menu: click on "Set/Monitor". That's so you can see the throttle position and RPM, etc. while the engine is running. Turn on bike's ignition and kill switch to "Run" and "start" Monitor. If you get some numeric values of temperatures and pressures. Great. That means your com Port is set correctly. If you choose the right port, the cable is connected properly, the bike's power is on and the kill switch is in "Run" position, you should have the Monitor showing current data about the bike. You can start the bike and watch the values change. Monitor doesn't have the world's quickest refresh rate, but unlike some aftermarket tuning "schemes", it seems to be very solid. Remember - the ECU has to run the bike AND communicate to the outside world, reliably. Our Teka 4usb refresh rate, for instance, will visually trace on the table, you "blipping" the throttle in neutral and that's quicker than anything else I've seen - but Denso's Monitor is perfectly fine for steady state testing. Bummer is if you are using the correct com port and you get a "Can't find ECU" error message. Wire harness adapter's 2 wires are inserted in the large ECU connector and the connector is plugged into the ECU. Wire adapter is plugged into "ECU to PC/Laptop Interface Cord" AND the bike's stock wire harness. ECU to PC/Laptop Interface Cord is plugged into your serial port. That's all I can think of at the moment. Hopefully that's all you need. I happen to use a laptop to do KRT tuning. Older laptops tend to have a serial port and newer laptops tend to only have USB. I try to not use USB to Serial converters for the initial bike/computer setup as there are potential and common special USB properties than can prevent communication - even though all seems ok. So, assuming that you've got your Monitor running (all you really need to view is Throttle % and RPM). You can go up to the main menu and select the items that you want displayed in Monitor. Limit it to RPM and THrottle %. Go up to main menu: Select File/Menu or hit the "F1" key. Up pops a box named "Menu dialog". On the right, select "Multimap edit". Up pops another box that is mostly grayed out, "Multi Edit Mode" is selected and says "#1,#2,#3" and is supposed to say #4 is you have the right Windows font. You can't really select anything different here. When you click "OK", you are temporarily locking "Compensation Map for Injection No.1" and "Compensation Map for Injection No. 2" together. Compensation inj table 1 is the fuel rate for cylinders 1&4 and Compensation inj table 2 is cylinders 2&3. After you click OK, you'll see that your upper menu "Label" field will say "#1,#2". That means Compensation inj table 1 and Compensation inj table 2 are locked together (and not just cylinders 1 and 2). Magic! Something familiar is on the screen. On the top, the "Map" there's actually a bunch of overlaid lines at "0" (it looks like 1 line) and on the bottom, there's a familiar fuel injection "offset TABLE". Looks similar to a Teka 4usb or PC table. Technically, a graphic representation of a numeric "table" is a "MAP" and a spreadsheet-like looking grid of numbers is a "TABLE". Dynojet calls their Tables "maps", so, that can be confusing when you work with a larger manufacturer's products. Denso doesn't let you see the actual base tables, they only let you modify offsets (to their predefined limits). It's the same in the Suzuki, Honda "kit" Denso ecu's. Note! The Denso software is set up to really NOT want you to accidentally leave the 2 Comp inj Maps linked. It will delink them whenever you change to another type of map or when you exit the program. So - if you want them linked (and you usually do when doing initial tuning, check that "LABEL" displays "#1,#2" exclusively in the dropdown listbox. Double click on the rpm increment you want to change, change it. The program will force you to do increasing value steps, from left to right (as it should be). In the 600's, you probably use 2000 to 15000, and I think that the standard_data.est in the 05 600 was 3000 to 16000. If you raise the rev limit, maybe you'll have to use 3000 to 16000. Remember, these are REAL rpms, not the bike's TACH rpm. The stock tach is ~10% optimistic (as common with stock tachs). A relatively stock bike doesn't make power at a real 16000 rpm or is mechanically, in the valve train area, strong enough, so it's not recommended to raise the rev limit to 16000. In fact, in a stock engine, DON'T DO IT!!! You cannot add, what is called an extra "rpm breakpoint" in FI tuning language, you can only change the value of an existing breakpoint. I think that there's 12 rpm breakpoints (from memory). You can change the THrottle % breakpoints, too. I feel that 100, 80, 60, 50, 40, 30, 20, 15, 10, 7, 3, 0 are pretty comfortable and a little better than the "standard_data.est" values. I'm doing this from memory, so if you need another, I'd add 25% TH). Those are not quite as fine an increment as the THrottle % breakpoints that are used in our Teka 4usb module, but the 12 KRT THrottle breakpoints are better than a power commander's coarse THrottle breakpoints. You might notice that I capitalized "TH" in "THrottle". That's because eventually, I'll just type "TH" and you are supposed to know that means "THrottle". After you make the breakpoint values, Save the map as "MySTD_data,2k16k,myTH.est" or something that makes sense to you. It will, by default, save it in your selected "machineSelect" bike's WORK folder. Ok - maybe it's time to actually tune. They religiously "tune to an af ratio" on a dynojet dyno at racetracks and think that's the best it can be. (I guess that's why they do it....). It takes 2 to 4 hours to tune the entire rpm / TH band, fuel and ignition to Best Power using an EC997 dyne system to close to 100% potential - Meaning it's tuned to Best Power AND well enough to be a streetbike, with smooth lowend cruise, etc... Takes about 1/2 hour - 45 minutes of running to start from scratch and do a "racetrack" quality job. A "Racetrack" job is making the bike idle and take throttle, then tuning any horrible spots, then tuning the all the throttle positions and rpms that the rider will use on the track. A "Street" job takes longer - as you have all the "cruise" throttle positions and rpms to do too. It takes a dynojet dyno an hour or 2 to completely tune to "an af ratio" at all rpms to 90% potential. (and they are not even close on the ignition 90% of the time) and probably still not at a silky smooth streetbike cruise level.